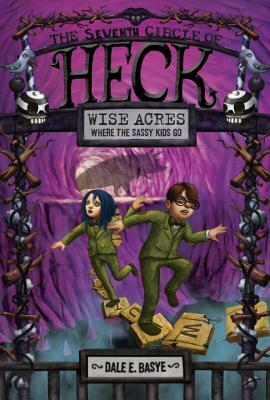 In the seventh installment of Heck, Dale E. Basye sends Milton and Marlo Fauster to Wise Acres, the circle reserved for kids who sass back. In Wise Acres, the cleverest, snarkiest, put-downiest kids debate and trade insults in Spite Club. But the new vice principal, Lewis Carroll, has some curious plans to raise the profile -- and the stakes -- of the competition. Now a full-fledged War of the Words will be broadcast through the afterlife. The winner will get the heck out of Heck and go straight to heaven. And the loser? Well, the loser goes down . . . all the way down to the real h-e-double-hockey-sticks. And Milton and Marlo are on opposite teams. Can they find a way out of Lewis Carroll's mad-as-a-hatter scheme? Or is one Fauster about to pay a permanent visit to the Big Guy Downstairs?